This gorgeous Diamond band is a true symbol of endless love with seven flawlessly cut Diamonds on display radiating pure fire and brilliance. Each dazzling stone sits between four prongs sitting above a split shank allowing for light to flow in and out from all angles. 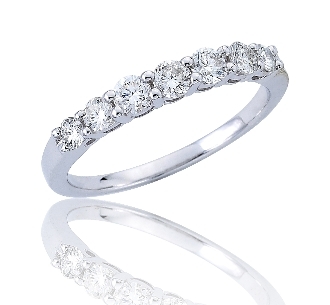 Set in highly polished 14 Karat white gold this ring makes the ultimate romantic gift. Can be worn as a wedding band or given as an anniversary gift. For added appeal personalize your item, select our Engrave option and indicate size needed when adding to Cart.